Fuel Availability. With the exception of solar powered generators, all generators run on some sort of fuel (gasoline, diesel, propane, natural gas). After Hurricane Sandy hit the east coast fuel shortages were immediate and widespread, how much more if a large scale power outage occurs over a prolonged period of time? Gasoline and diesel will not be available for purchase from local stations and any that happens to be on hand will most likely go to emergency vehicles first. Propane will be long gone at the local hardware store (it was all sold out prior to Hurricane Sandy hitting in some areas). Generators powered by natural gas will initially be immune to this but will soon face their own shortcomings. Fuel Storage Considerations. Most portable generators use between 8 to 22 gallons of gasoline per day, compared to 4 to 8 twenty pound propane tanks (propane generators). That’s quite a bit of fuel just for one day’s usage and it’s simply not realistic to assume that the average person will be able to store enough fuel on site to keep the generator running for weeks on end. At 15 gallons of gasoline per day, that equates to keeping 42 five gallon gas containers on hand to power the generator for 2 weeks. Even a large 250 gallon propane tank only has a 3 to 4 weeks worth of fuel, if that. Hardly enough to keep the lights on during a long term grid down scenario. Reliance on the Electric Grid. Even gasoline and propane powered generators rely on the electric grid. 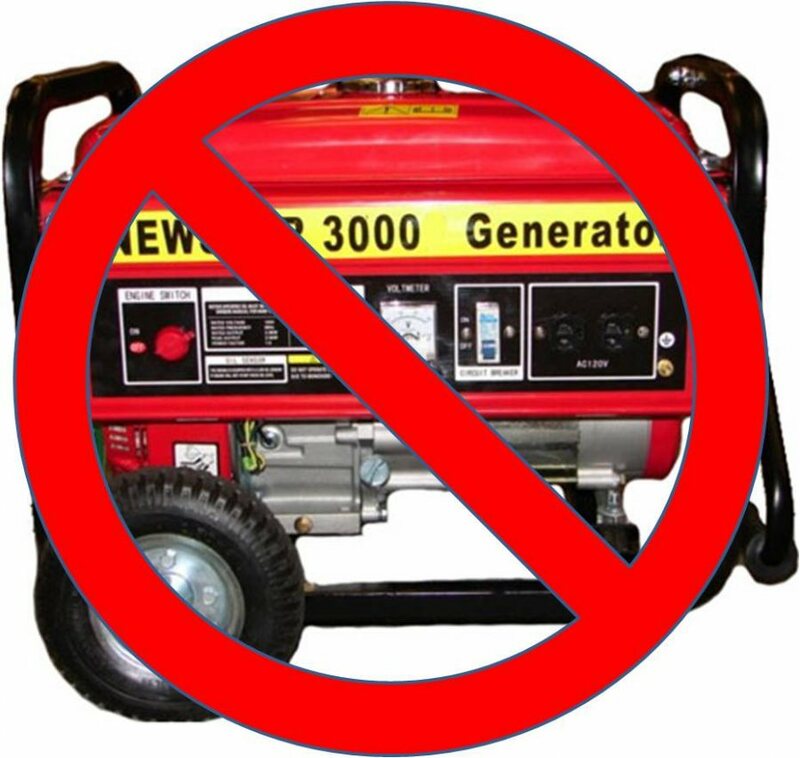 If the grid goes down and stations/retailers can’t sell fuel/propane generator owners will simply be out of luck. This is also where folks who own standby generators will run into trouble. Many standby generators run off of natural gas which is piped into homes from pumping stations, which relies on the electric grid to maintain adequate pressure throughout the system. Translation: if the grid goes down for an extended period of time many of those expensive and professionally installed standby generators will be good for nothing more than scrap parts. Operational Security (OPSEC). Imagine this: you haven’t had power in your area for a month. You are tired, dirty, hungry and out scavenging for food in neighborhoods that have been abandoned when you hear it. It sounds like a motorcycle with the throttle opened halfway, a constant wailing noise. Could that be a generator? Someone has power! That must mean that they also have food, water, maybe medicine! You see where I’m going with this don’t you. Even if you could magically keep your generator running long after T-SHTF you would only succeed in making yourself a massive target (unless you live out in the country). Load Capabilities. This is where solar powered generators meet their match. While having a solar powered generator is better than having nothing at all, most are incapable of providing long term viable power solutions. Consider the Goal Zero Yeti system. Based on my beer math you could power a few appliances for a couple hours before discharging the entire battery, at which point it would take (optimal) 20-24 hours to recharge the battery from the solar panels. Again better than nothing at all during a long term grid down scenario, but definitely a reason to not count on it. What happens if you completely discharge the battery and heavy clouds and fog roll in (read: degraded charging) for a week or more?